The main difference between loving someone and being in love is that when you love someone you expect the other person to reciprocate your feelings and give you equal commitment whereas being in love you do not necessarily expect the other person to reciprocate your feelings, and you can even be the only one loving. Love is a wonderful feeling we all experience. This beautiful feeling can be romantic, affectionate, caring, and even sacrificing. Therefore, love comes in all forms and sizes, and with different people, at different times we may have never imagined about. Therefore, we often find ourselves with no logical explanation about things concerning love. Loving someone and being in love with someone are two such facets of love. We love someone due to varied unexplainable reasons. You might at first get attracted to or infatuated with someone, and later on, you learn about him/her: their depths, their fears, their interests, their morals, flaws, qualities, their choices. In other words, you penetrate into their personality. And loving someone means to love him/her after this deep consideration on that person’s personality and accepting that they can match well with yours as well. Therefore, we make a careful choice when loving someone. Love transcends all matters of time and persons. So once you’ve made that choice, it will hard for you to walk away from it. That’s when you will realise that you love that special someone in your life. Therefore, the craving to have that person in your life, right next to you no matter what, governs all other reasons to move forward. Therefore, you can enter into a romantic relationship if you succeed to win the other person’s hearts as well. So when you realise it is hard to let that person go away from your life, you will do whatever it takes to have that person in your life. Nevertheless, if it doesn’t fall into the right place, you still can make up your mind and release them from your life. So when you love someone, you expect to give as well as receive the best for/from him/her. In other words, this is a balanced feeling since they are in love with you and are willing to do the best for you as well. Moreover, there is a deep possessiveness that comes with the craving to keep them next to you. As a result, you might feel jealous and angry when they suddenly start ignoring you. This is because you believe that just as you are being committed to keeping this love going uphill, your lover should do the same. Therefore, rather than feeling how the other might feel, you need him/her to make you feel the best. And if you don’t feel them giving it to you in a satisfactory way you become sad and even annoyed or suspicious. Simply loving someone is expecting that person to return back the same sentiments to you as well. However, there is a possibility that this love can change or subside with time due to varied reasons such as sudden changes in your lover’s personality. Thus, loving someone can also end; this is why most couples have heart-breaking breakups due to numerous reasons. Maybe they never imagined that things that they once believed would never change so drastically with time. Being in love is another facet of this wonderful experience of love. Unlike loving someone, being in love means not expecting them to return the same feeling for you. It doesn’t necessarily mean that you don’t want them to, but you are fine with them not doing the same that you are willing to do for them. Thus, there is a strong sense of sacrifice on your part when you are in love with someone. It may be difficult to find the exact reason for being in love with someone. In other words, being in love with someone happens without your consent or your knowing. Often you might wonder when and why you started being in love with that person, but you end up with no possible answer. That’s because being in love with someone is not a choice you can make, unlike loving someone. Similarly, the person you love might or might not know that you are in love with him/her, yet your feelings won’t change for that person. Same way, even if he/she knows and convinces you that they can not reciprocate your feelings for you, you will still love them and wish the best in their lives for them. Therefore, unlike wanting them to be always around you when you love someone, you can still love that person even if that person is not a part of your life or if he or she is a thousand miles away from your reach since you are ready to make that sacrifice in order to keep them happy forever. However many fights you might have with him/her you will still hold on to him/her since what drives you are not some mere physical or other reasons; it is that loving feeling that is well rooted within you yourself. Therefore, there is no expiration date for being in love with someone, and still, you are willing to make that person a priority in your life. Moreover, there is no specific strong romantic craving for that special someone you are in love with. Yet you still care, love, and has affection and always wish the best for them. In that way, this facet is similar to a way how a mother loves a child, even when her child hurts her at times or even treats her bad, she will still do the best for her child no matter what. However, since there is no possible expiration date for being in love with someone, it may at one point hurt you if you start thinking only about him/her without giving space to another person. In such a situation, letting go of the place you’ve given to the person you are in love becomes harder than letting go of the person you loved once. You might start loving the person you are in love with, after feeling that other person likes/loves you too. Loving someone necessarily means to love someone after considering how well they can match you and expecting them to reciprocate the same feelings whereas being in love with someone means to love someone even when they don’t reciprocate the love you have for them. 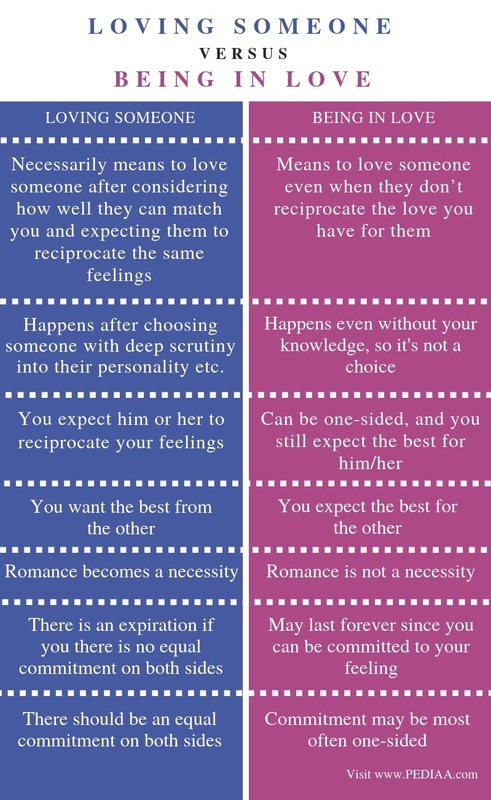 This explains the basis of the difference between loving someone and being in love. Loving someone happens after choosing someone with deep scrutiny into their personality etc. whereas being in love necessarily is not a choice, it happens even without your knowledge, even when you realize that person has nothing that you are looking for, you will still be in love him/her. Hence, being in love is not a choice that you can make. Therefore, this is one important difference between loving someone and being in love. The main difference between loving someone and being in love is that when you love someone, you expect him or her to reciprocate your feelings. On the other hand, being in love can be one-sided, and you still expect the best for him/her. Also, when you love someone you want the best from the other whereas when you are in love with someone you expect the best for the other. Romance is another important difference between loving someone and being in love. That is, romance becomes a necessity in loving someone. On the other hand, you can still be in love with someone without any romance with that person. There is a sacrifice in loving someone, yet it should be equally balanced. However, the sacrifice when you are in love with someone is transcendental as you don’t expect them to do the same thing for you. Similarly, you can sacrifice your feelings by letting them go away from you to a better place than you. But when loving someone, you won’t let them go away from you. This is yet another difference between loving someone and being in love. Possessiveness is a very important difference between loving someone and being in love. There is a strong sense of possessiveness in loving someone, and you tend to think the other person belongs to you so that you can never let them be with someone else. When being in love there is more sacrificial feeling than a sense of possessiveness; you know having them around you will mean the world to you, yet you can wish the best for them even if it means to cut all their ties with you. Furthermore, there is an expiration to loving someone if there is no equal commitment on both sides whereas being in love with someone may last forever since you can be committed to your feeling. Also, there should be an equal commitment on both sides when loving someone whereas commitment may be most often one-sided when you are in love with someone. Love is the strongest attachment that anyone can feel for another. Yet there are different facets of love, which we fail to recognize from the other. Loving someone and being in love with someone are two such facets that have many differences. The main difference between loving someone and being in love is that when you love someone you expect the other person to reciprocate your feelings and give you equal commitment whereas being in love you do not necessarily expect the other person to reciprocate your feelings, and you can even be the only one loving.